2,4-D and dicamba are synthetic auxin herbicides that kill broadleaf plants. Synthetic auxin herbicides are a means of controlling weeds among cereal crops, like corn and wheat. However, because 2,4-D and dicamba were designed to eliminate broadleaf weeds, the use of these herbicides has the harmful side effect of injuring broadleaf crops, like soybeans, tomatoes, grapes, green beans, peas, cucumbers, squash, melons, pumpkins, and other fruits and vegetables. In addition, herbicide application inconsistent with label directions can harm corn production. Right now, a new class of genetically modified 2,4-D and dicamba tolerant crops are awaiting regulatory approval. The purpose of these crops is to permit the more widespread use of these herbicides. Regrettably, 2,4-D and dicamba are both notorious prone to drift and volatize, thereby causing injury and plant death to nearby crops and rural landscapes. Spray Drift – Spray drift is the airborne movement of pesticide spray particles to non-target sites. Spraying during windy conditions, or using nozzles and pressures that result in the creation of fine spray droplets, increase the risk of spray particle drift. Volatilization – Volatilization occurs when a pesticide is applied to a target site but then evaporates and moves in the air as a gas. The calm, windless environmental conditions that might minimize drift, ironically, only increase the potential for volatilization. Are 2,4-D and dicamba dangerous? While other chemicals are certainly more dangerous to human health, 2,4-D and dicamba have proven to be especially prone to cause drift and volatilization damage. A survey of state pesticide control officials listed 2,4-D as the herbicide most often involved in pesticide drift incidents for every year the survey has been taken. 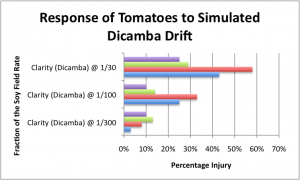 The same survey listed dicamba as the 3rd most commonly involved in drift incidents for two years in a row. This incidence of drift occurrence far outpaces the relative use of these herbicides. 2,4-D ranked 7th on an EPA list of most commonly applied conventional pesticide active ingredients. Dicamba did not even make the list of the top 25. Drift concerns have led some states to enact safeguards such as requiring the use of lower volatility formulations, restrictions on application times, and even bans on synthetic auxin herbicide use. Since the coalition’s mission is to prevent crop injury, we refer to them as our most dangerous herbicides. Applications of 2,4-D and dicamba at levels as low as 1/300th of the field rate for soybeans caused statistically significant field loss in tomato crops. Late drift of either herbicide, during bloom, caused a 17-77% reduction in the marketable fruit when applied a 1/100th of the field rate. The simulated drift caused the tomato bloom to “abort,” causing a subsequent late bloom. This means less red tomato fruit and more unmarketable immature green tomato fruit. Early drift of 2,4-D, soon after transplanting, resulted in up to 25% loss of ripe fruit at 1/100th the field rate and 43% increase in green fruit. 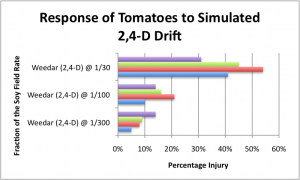 ¹Doohan, Doug and Koch, Tim, Effect of Simulated Dicamba and 2, 4-D Drift on Processing Tomatoes, Ohio State University/OARDC (2010). Get involved! : Join the Save Our Crops Coalition. We provide regular updates to members to inform them of opportunities to appropriately participate in the regulatory process in an effort to protect against non-target damage from the use of 2,4-D and dicamba.